I was a very frightened and distraught seventeen-year-old who, having returned home twenty minutes late from church choir practice, was locked out of my house. My boyfriend had brought me home after he and I finished rehearsing for an upcoming cantata. I pounded on the door but my mother wouldn’t let me in. This was an era of no cell phones. Daniel took me to the closest phone booth and I called home. Mom answered and when I asked her what I was supposed to do….she said she didn’t care. So Daniel called our pastor who told him to take me home with him. I was heartbroken and scared to death. I hadn’t met Daniel’s parents. They lived on a farm about twenty miles away and had been raised Amish, his Dad now being the pastor of a small Conservative Mennonite church. This was the ’60’s and I was dressed in a mini-skirt, make-up, fancy hairdo, jewelry….all those things not befitting a proper little Mennonite teen. But I had nowhere else to go. This was how I met my future in-laws. And this was the beginning of decades of a dear and loving friendship with my mother-in-law, Clara. I’m not sure what she saw in me….perhaps it was the look of desperation in my eyes….and I was so drawn to the sparkle in her lovely blue ones. Clara Rosa Miller gave me a mother’s love I so craved. She taught me to cook, to bake fresh bread, to can and freeze fresh vegetables in the garden, to hang fresh laundry properly on the clothesline, to raise babies, to sew clothes for my family and to laugh. I loved hearing her laugh till tears came over some silly thing I did or said. I taught her about makeup, fashion, hair and jewelry and movies……I was as much of an enigma to her as she was to me and we loved each other mightily. 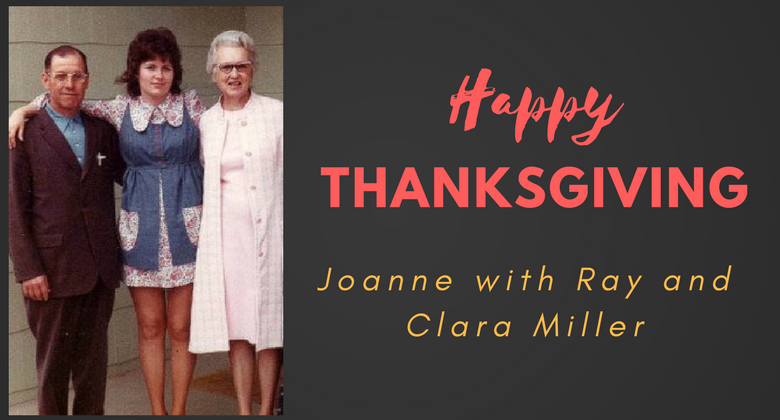 On this Thanksgiving…as on decades of Thanksgivings, I am grateful for the woman who nurtured in me a desire for peace and love and family. Her legacy lives on in each of my children and grandchildren. Her spirit lives in the corners of each room of my home. Who in your life touched you and profoundly changed you? And, how are you passing along that love? I pray I have had an impact on others in the way Clara had on me. I wish every day I could tell her thank you. I hope you will take time to thank someone who has made you laugh…..who has touched your heart and your life. Blessings to you this Thanksgiving and may peace be with you through this holiday season. So very dear and beautiful when we are accepted and loved just the way we are. What a gift! I’m thankful for YOU and your loving heart. How you welcome others in and make them feel like family. Thanks so much, Ruthie! You and your family are such a blessing to me. Happy Thanksgiving! Miss Clara’s signature is embossed on your heart and your heart has touched mine (and many others) in so many ways! Thank you for sharing yourself with us and for inspiring me to love well. Wow Patsy…thank you so much. Passing along the love…and acceptance….is something I take seriously. You are a blessing to me. AWW…thank you Myra. Our history goes back a long way….and I cherish our friendship. Love and peace…. My heart breaks for that scared 17 year old girl, however smiles to hear of your dear sweet mom in law. It would have been easy to stay bitter at the past but so wonderful how you both embraced the blessings. Happy Thanksgiving to you, Dan and the family. I miss those days when we solved all the troubles in the world over a cuppa! We could RULE the world!! hugs, my friend….and peace…. Joanne, you have touched my life in a profound way, and I am so very thankful for you and your friendship. I love you my sweet, dear friend!! Your story reminds me of how blessed I was with my Mother in law , Margaret Moore. The love and acceptance from the very beginning! My husband and I were raised quite different, but living in Pennsylvania with the Moore’s I learned what a loving family experience is all about. I too learned all the skills you mentioned and my children had wonderful Grandparents they adored! That’s what family is all about and gives us so very much to be thankful for! The Moore’s and their great Thanksgiving traditions and festivities will continue on tomarro! Have a great Thanksgiving the Millers! Thanks for the great comment, Kathy. This kind of love and acceptance is rare in families and I know you feel blessed as I do. Now we can pass along the love….. Thanks for the great comment, Kathy…..we were blessed…and now we have the joy of passing along the love….. Yes, I was so blessed to have her in my life. Thanks for taking the time to comment. Blessings and love, dear sister. So beautiful!!! I love your story. I had someone like this – my grandmother who took me in, accepted for who I was, loved me unconditionally and most importantly- introduced me to Jesus. Thank you for sharing your incredible message. Happy Thanksgiving ! I pray everyone has someone who speaks into their lives in ways that are life-changing. It’s how we pass along the love. So glad you had your grandmother. May your holidays be filled with peace and love…. Mom, this is beautiful! Brought tears to my eyes. I’m so grateful for our family, and for all the amazing memories of Grandma and Grandpa. Yep, made me tear up as I read it out loud to my girls…two of which are named after this beautiful woman. I am so grateful to have had the relationship I had with her as well, and grateful to know that her legacy DOES live on through you. I have no doubt that my daughters will write stories of their own sweet YiaYia and the relationship of love, patience and laughter they have with you. Thank you for being the legacy that lives on of Grandma Clara. I’m grateful for her, and for you. Love you, Mama. Yep you were a shock and surprise to my family. I’m forever grateful that they quickly grew to love and accept you – with all the vibrancy and magic you added to our rather solemn family. I am thankful they saw through the very different exterior to the loving, giving heart you have always had. What a beautiful story! It brought tears to my eyes and joy to my heart! Thank you, Adele….I apparently touched hearts with this one…I got a lot of responses that it brought a tear to the eye. Thanks so much for your comment. Blessings and peace…. Betty, I am so glad I speak to your heart…and that you are passing along my blogs. I am honored. My your home be filled with peace and love during this holiday season…. Oh my, this is a fantastic story. My now wife Alison and I kind of had a similar one where I brought Alison to meet my very conservative grandparents and extended family for the first time. She was very nervous and when we arrived we were promptly sat down to eat some food that was remaining from the dinner meal they were just finishing up. It had been understood in that family that you should never leave your plate empty. Well the food was quite dry by that point and combined with the nervousness/ anxiety, when I looked up at Alison I realized she was scared of making a horrible first impression as there was no way she was going to be able to finish her food. And I could see the tears beginning to form. Thank God He had me act quick. Thankfully I had almost finished my plate and I still to this day do not know how we pulled this off, but we somehow switched plates without anyone noticing. She finished the few bites left on my plate and I finished hers. No one noticed, I looked like a hero and the rest of the weekend went fantastic. It was a win, win, win situation. What a sweet comment Tom. Thank you so much. Yes, our home is a Haven of Peace and love….always. And it warms this mother’s heart that each of our children are exemplifying that same love and peace in their own homes…and in their lives. Glad you felt that in your connection to Jared. Blessings to you….